The Story: After the death of his child and commitment of his wife, Van Helsing decides to run away from his problems by taking a job in China. He escorts a body to China, and is accompanied by a priest named Master Xi and a young man named Fu Zheng Lei who may be a young Fu Manchu. They find themselves pursued by the last of 7 vampire warrior brothers. Notes: Chris Roberson is one of my favorite authors of crossover fiction, and should I get around to writing the Sci-Fi Crossover Encyclopedia, I will be able to present my greatest case for my opinion. This story brings in Hammer Film’s Legend of the 7 Golden Vampires, which is a piece that supports Chuck Loridans’ soul-clone theory. This story also brings in Fu Manchu, though only his original stories by Sax Rohmer and any crossovers in this book. The Story: The undead Count Dracula, known in life as the 15th century Prince Vlad, the Impaler, lives in Transylvania, but comes to London with grand plans never truly stated, but with a side goal of taking young Jonathan Harker’s fiance Mina Murray as his bride since she seems to be the reincarnation of his former bride from his living years. Professor Abraham Van Helsing comes to the aid of the young couple and helps to slay the vampire and his minions. The Story: Kah is a Chinese monk who also happens to be the vampire leader of the 7 Golden Vampires. He comes to Dracula’s castle to seek the aid of the count, but instead the count possesses the monk. Years later, Professor Lawrence Van Helsing is lecturing in China when he gets involved in fighting six of the seven remaining golden vampires along with seven martial artist brothers. Notes: This film was the inspiration for Chuck Loridans’ soul clone theory. 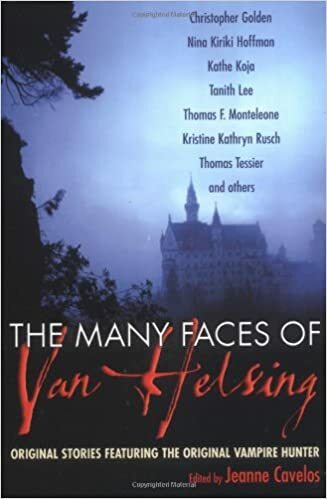 The story of what became of the seventh golden vampire is later told by Chris Roberson in the Many Faces of Van Helsing. This film follows the Satanic Rites of Dracula. It was remade in 2003 in the Era of Vampires. The film has been referenced in Dust Devil, Don’t Wake the Dead, and From Dusk Till Dawn 3.